Have you ever needed a central, focused location for an outdoor activation? An area in the middle of your event that really brings attention to what is happening without worrying about distractions? A bold, lit area that immediately draws your attendees to the area that you want focused on? 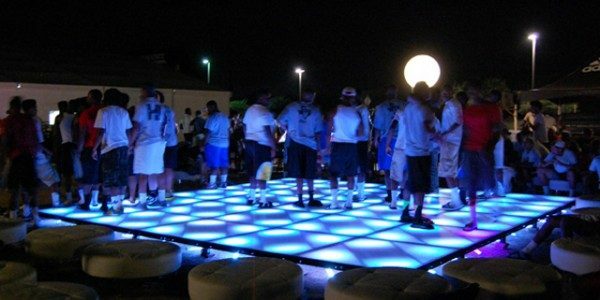 Consider an outdoor LED Dance Floor rental for your event! One of our most recent events was an outdoor activation for a major shoe manufacturer. This live, private event sent invitations to a state ranked football team for product giveaway and staged the event in an outdoor football field. The event was held after dark with a party theme, DJ and lounge furniture. However, a focus point was needed to draw attention to the middle of the activation at the right time. An outdoor LED Dance Floor turned out to be the perfect centerpiece of the event. On cue, the dance floor lit up in bright white, highlighting the product, the players and the activation in an exciting and dynamic way. The end client was very happy with the finished product and was very pleased that attention to their brand of shoes was presented in such a memorable way. And In Depth Events is one of a handful of companies across the United States that offers outdoor LED Dance Floors for rental.